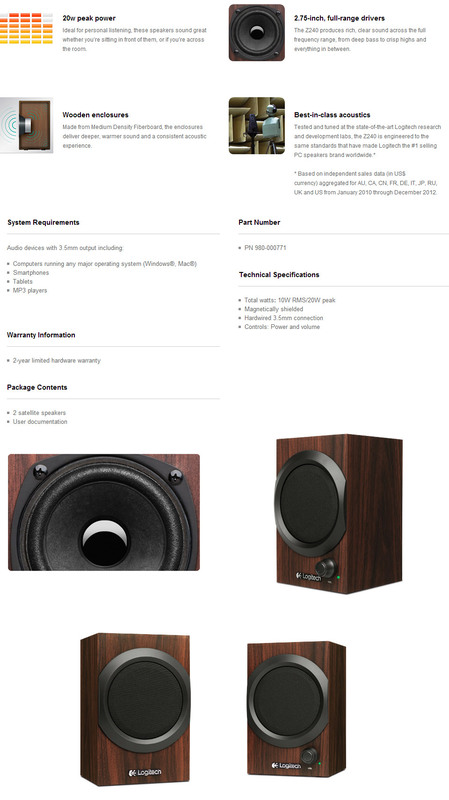 20 watts (10W of RMS power) of powerful acoustics – produced by 2.75″ full range drivers. 3.5mm input means these speakers can work with a computer, tablet, smartphone. Just plug in and start listening. Mains powered. Hardwired 3.5mm output cable. The Logitech Z240 is made out of medium density fiberboard giving a deaper and warmer sounding acoustic experience, with an output peak power of 20w and a 3.5mm input making the Z240 ideal for personal listening.